BS Club Show - Budgerigarworld.com - The international website for the hobby worldwide. A website all about Budgerigars. All Entries Tagged With: "BS Club Show"
Entries to be accepted on Saturday morning. All roads will be leading to Doncaster for the weekend of 1st & 2nd October 2011 for the Annual BS Club Show. 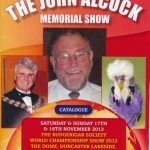 The Budgerigar Society decides to move its Club Show back from October to November in 2012.